This year is the turn of McLaren Senna after Bugatti Chiron, a LEGO sports car that in 1:1 full sized. The whole car is made up of Lego components, from interior structure, seats, and decoration of the car. A total of 467,854 pieces were used in the entire car, and the assembly time was as long as 2,725 hours! Unfortunately, although it has a V8 twin-turbo engine, it can’t legally drive on the road like LEGO Bugatti! Looking back on the past sports car series, LEGO constantly upgraded the parts, and making the sports car looks the same as the real one. The first real sports car in LEGO history belongs to 8880, with a total of 1,343 pieces, far exceeding the other Lego set at that time. The 8880 includes a four-speed gearbox, independent suspension, steering system, and other functions. After 8880, LEGO sports car series keep upgrading and the details are more and more amazing. After a lapse of five years, LEGO launched the super sports car 8448, which has been greatly improved on the basis of the previous ones. The configuration is luxurious, and the carport and the door can be opened and closed. 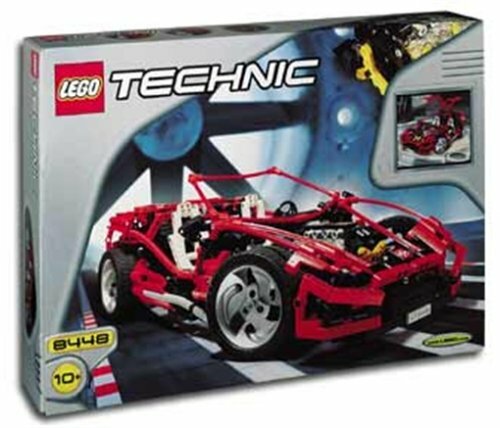 Since then, the sports cars produced by Lego have been streamlined, and parts have been used with soft rubber parts and panels. The lines are more fluid and the contours are more realistic. In 2005, Lego launched the first Ferrari-licensed sports car, Enzo Ferrari. The building blocks version 8652 Enzo Ferrari became the most exquisite sports car model at the time with a ratio of 1:17 and a width of 14 squares. The mechanical group version 8653 Enzo Ferrari perfectly restores the real car at a ratio of 1:10, but there are still regrets that the lights are used with stickers and the doors cannot be opened. This Lamborghini Gallardo LP 560-4 police car has 801 parts and is the classic collection of the Racers series. The blue and white color scheme and the police sticker are the biggest highlights of this product. Its front and rear covers and doors can be opened and its built-in engine can be seen. The dashboard, steering wheel, handbrake, throttle brake and car clutch in the car are all restored! The 42056 Porsche 911 is premium in the sports car and has a high collection value. Its number of parts has reached an unprecedented 2,704 pieces. Its appearance, internal structure, suspension structure, interior height restoration are in detail! It is Porsche officially authorized LEGO, in accordance with the ratio of 1:8, is the first time LEGO has built a sports car model at the collection level. However, some LEGO fans reacted to the assembly process very laboriously and the price was expensive. Of course, the 2018 technology masterpiece is the 42083 Bugatti Chiron. The total number of parts has reached a new level, with a total of 3,599 pieces. It is elegant, smooth and is made in a ratio of 1 to 8. The whole car is 14 cm high and 56 cm long. The configuration is exquisite and impeccable, with a 16-cylinder engine, independent suspension, 8x gearbox. Although it is pricey, but worth it if you can take the RM16 million sports car home! + 6 New Batman Sets 2019 on His 80th Anniversary! +LEGO From The U.S is Cheaper? If you have any question about item purchase, parcel forwarding, tax avoidance, and shipping methods, welcome to read our cross-border shopping guides. + What Items Are Prohibited and You Can’t Ship From Overseas? + Cross-border Shopping Can Save Import Duties and Consumption Taxes! +Courier vs. Postal, Which to Choose When Shopping Overseas?